The streets of Thailand will be splashing with fun, music and excitement for the Water Festival (also known as the Songkran Festival) between April 13th to 15th. The Thai people are well known for their intricate and beautiful fruit carving. 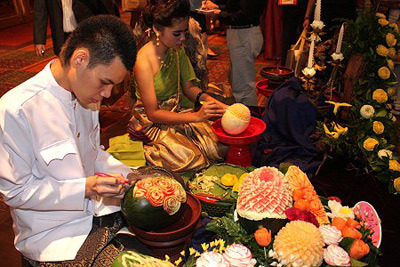 During the Songkran Festival fruit carvings are prepared to display and share as you will see further down in this article. 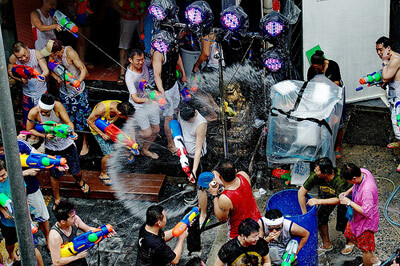 But first, let me show you why the Songkran festival is also called the Water Festival. Anyone who is outside in Thailand during this time is a fair target for drive-by water shootings, water balloons and garden hoses. 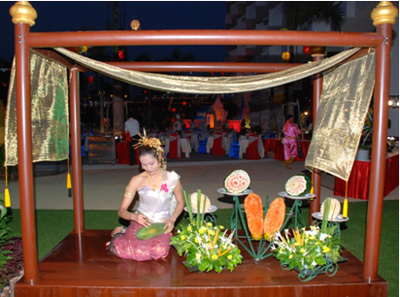 But not to worry, the Water Festival activities are all in good fun to welcome the Thai New Year. 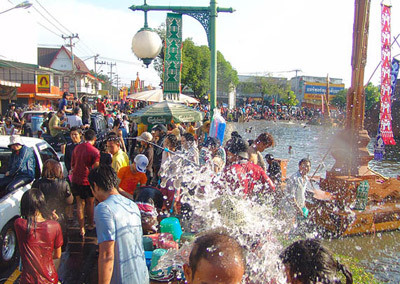 In fact, the Water Festival is a welcome relief from the hot weather in Thailand during April. Many other countries in Asia also celebrate a New Year in April and regard this time as a period of transition to welcome positive changes, while clearing out negative elements from the past. Many of us may associate this idea with Spring season, such as spring cleaning, which doesn’t sound as fun as a massive street water fight! So I’d like to invite you on another armchair adventure to mystical Thailand for the Water Festival. 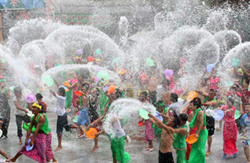 The word Songkran in Thai means “a change”, so the Thai New Year symbolizes a cleansing period. In addition to cleaning their own homes, temples and statues, the Thai people also participate in spiritual rituals during the three day festival. Acts of good deeds that are carried out during this time include giving money and paying respect to elders and religious statues. Water is symbolic during the Songkran because of its cleansing properties and its ability to wash away bad luck. As a sign of respect, the Thai people will sprinkle scented water on elders, including monks. 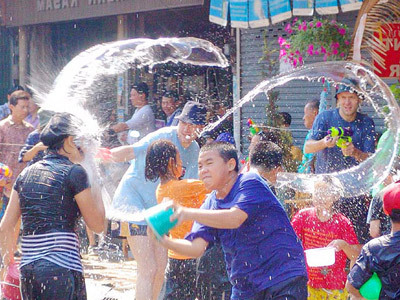 This humble act eventually evolved into the Water Festival fun that flood the streets of Thailand with merriment and tourists from all around the world. Even though the Water Festival is supposed to be a three day event, many of the festivities start earlier and may last up to two weeks in some parts of Thailand. Doesn’t that look fun and refreshing? There are a few Water Festival rules, however. Water cannot be thrown at moving vehicles or at elderly locals who specifically request to stay dry during the festivities. My carving teachers are Thai and so I had the opportunity to participate in a couple of local Songkran Festivals in California. The Water Festival splashing and spraying was a lot more subdued than what you see in the photos in this article but there were still plenty of children armed with water guns and bottles. Our own version of the Water Festival/Songkran Festival to honor the Thai New Year did include fruit carving and beautiful Thai dancing. 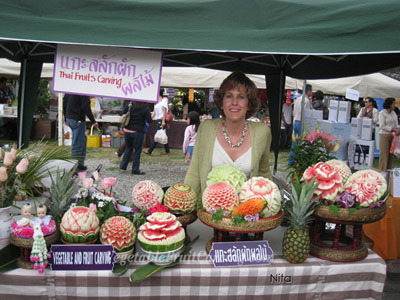 You can see some of the lovely Thai fruit carvings we made for the Songkran Water Festival. You can also see more photos of Thai fruit carvings from another year’s Songkran Water festival. 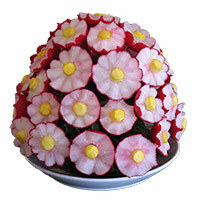 And if you’ve never tried fruit carving before and would like to check out an easy technique, feel free to sign up for my free lesson on how to make a simple but lovely radish flowers bouquet. I hope you enjoyed our short tour to Thailand for the Water Festival. Even if you don’t celebrate a cultural or religious New Year at this time, perhaps the spirit of the season will inspire you to pursue a new goal or adopt a new positive change in your life. And if you’ve ever experienced any major festivals around the world, such as the Water Festival in Thailand, I would love to hear your story! I got an email this morning from Paula who wrote, “Nita it’s my new year as well. I’m Cambodian this weekend is the weekend to celebrate. Happy New Year to all our Cambodian friends out there. happy new year to all thai and laos friends.